Author(s) Habib, M. A. R.
In the nineteenth century, literary criticism first developed into an autonomous, professional discipline in the universities. 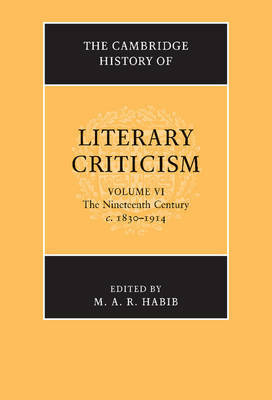 This volume provides a comprehensive and authoritative study of the vast field of literary criticism between 1830 and 1914. In over thirty essays written from a broad range of perspectives, international scholars examine the growth of literary criticism as an institution, and the major critical developments in diverse national traditions and in different genres, as well as the major movements of Realism, Naturalism, Symbolism and Decadence. The History offers a detailed focus on some of the era's great critical figures, such as Sainte-Beuve, Hippolyte Taine and Matthew Arnold, and includes essays devoted to the connections of literary criticism with other disciplines in science, the arts and Biblical studies. The publication of this volume marks the completion of the monumental Cambridge History of Literary Criticism from antiquity to the present day.